Nepal Para Sports Association (NPSA) will be holding the Special Games at Dasharath Rangasala the next few days. The NPSA has a great website where you can learn more about the organization and the Paralympic movement in Nepal. 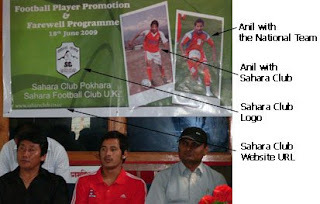 Sahara Club created a great background poster for Anil Gurung's press conference. All the elements that needed to be on it where there. I have been very critical of Nepali media on this blog, so when they do something well I should also be the first to point it out. The media frenzy over Anil Gurung's trials at Chelsea once again saw a host of inept articles being released. Poorly written stories, factual errors, incorrect spellings, etc. However there was one story - and unfortunately just one, that was excellent. Congratulations The Himalayan Times! Well done. The sport story of this week was the report that Anil Gurung was headed to the UK and would be practicing with the Chelsea reserve sides. Anil will also be going for trials with non-League outfit Woking Football Club. While the Chelsea gig is purely promotional it will be interesting to see how Anil fares at Woking. Certainly a Nepali National Team player should be good enough to impress a 6th division club; however, work permit regulations and ingrained biases against Asian players in England will make it challenging for Anil to extend his career in the UK. Burried in the Chelsea euphoria was news that Anil has been offerred a lucrative million rupee contract with I-League side Shillong Lajong Football Club. Now this news got me excited! India is a natural destination for Nepali footballers, but no player thus far has been able to crack into the I-League. If Anil signs with Shillong it will be a potential landmark day for Nepali football as many residual benefits could come of it. The Indian league is far better than Nepal's and their clubs pay handsomely. If our players go there it will develop both their talents and wallets. As domestic football is always mired in politics, the option of playing in India will provide a good alternative to our suffering players. Some may argue that players heading to India will hurt the domestic game and the National Team, but that is completely unfounded. With regards to the National Team, players will be playing a much higher brand of football in India, so their level of play can only improve. FIFA regulations clearly state that clubs must release player for national team duties, thus there should not be any issues when ANFA calls players for international matches. As for the domestic game - there is nothing to worry about. Our domestic football is at rock bottom already. There has been no league for two years and most of the professional footballers have left football for jobs at home and abroad. I know one player that was so desperate he went to Iraq with a manpower agency! When players see a path to riches in India they will stick with football. They will train and play harder for their Nepali teams in the hopes that they will get scouted by Indian clubs. Nepali clubs also stand a chance to benefit as they could potentially demand transfer fees for their players. So while most are rooting for Anil to extend his career in England, I'm hoping he takes the million and signs with Shillong to blaze a new trail to India for Nepali footballers. It is great to see CAN and Nepal Tourism Board jointly collaborating on a promotional video that highlights both Nepali cricket and tourism. The video reminds me a bit of Chak De India featuring SRK - though nowhere near as catchy. Let's just say the song plays much more to the pace of Test than Twenty20 Cricket. The production quality is quite good and it was nice seeing attention paid to details - like making sure that the uniforms of the players matched and that there were no stragglers in the background of the shots. Have you ever seen Kollywood music videos? You can see rows of onlookers and even production equipment as the hero and "heroni" are dancing around. The video was apparently made on the request of the ICC, to celebrate their 100 year anniversary. What this hints at is that Nepali sports bodies are quite good at taking orders, but pretty hopeless when it comes to being proactive. Maybe a few more orders need to be sent our way. 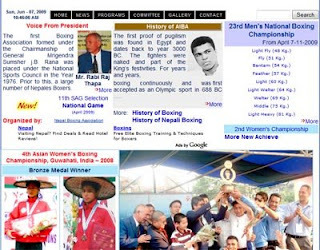 The Nepal Boxing Association (NBA) sent me a link to their website (www.nepalboxing.com). It's good to see them being proactive which certainly encourages a Nepali sports blogger like me to follow their sport more. The NBA website is quite solid. It has lots of information including the history of Nepali boxing. It also is filled with quite a few photos and results. The best part - if you send an email to their contact address, they reply! Good job NBA - I'll be sure to write some boxing stories in the near future. Bhadrakali Sports Shop must have recently made a massive order of fake Argentina kits. 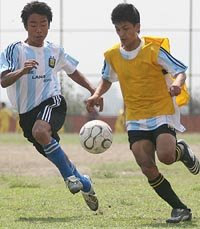 Looking at the pictures of the ANFA Coca-Cola School Tournament at NepalSportPhoto.com, it is surprising that so many schools are playing with Argentina national team jerseys. So much so, that a few times both schools were wearing the Argentina shirt, thus one school would have to put on bibs over their jerseys. I am just curious as to why the schools are buying national team jerseys in the first place? Do these institutions not have their own school colors and badge? Are all the tailors in Nepal too busy to accept an order? To draw a parallel - would the schools allow their students to come to class wearing the uniforms of a top college that their students aspire of going to? One small irritant for me since moving to Asia is turning on ESPN in the mornings and always finding some sort of X-Games related programming on. I'm looking for Premier League scores and all I get is Shaun White. The X-Games are awesome - for two weeks a year, not every bloody morning!!!! However, a recent alert that was sent my way may have me warming up to action sports. It so happens that there is a company in Nepal that is making skateboards. Totally rad! The firm is Arniko Skateboards (nice name choice - also if you did not notice the logo of the brand has the outline of the Nepali flag). Here is a brief article about the venture. 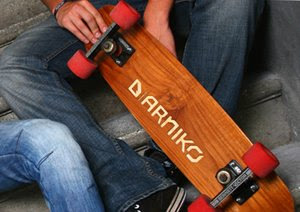 They have a cool website too: www.arnikoskateboards.com, though none of the models they use look Nepali. I hope to contact the proprietor(s) to learn a bit more about the company and get their thoughts on action sports in Nepal. Stay tuned. I apologize for hitting Nepali cricket so hard these days, but the national Twenty20 tournament is a real travesty. Here is an article in the Himalayan Times that expands on this. 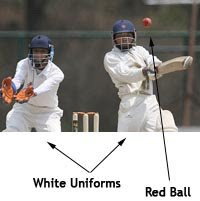 As you can see from the photo below, they are playing Twenty20 cricket with all white dress and a red ball, which is against the rules of this format of the game. India is right next door to us (and getting closer everyday) and we can't even cross the border and buy a few proper Twenty20 balls. IPL just finished its one month long tournament and we failed to learn a single thing from the spectacle. For the sake of your readers, I would like to point out that it is not entirely correct to say that Twenty20 has to be played with coloured clothing and a white ball. Even for International T20 matches, ICC's standard playing conditions state that coloured clothing and use of a white ball (with black sight screen) is only mandatory when atleast one match in the series is played under lights. I assume none of the matches at this event were played under lights. 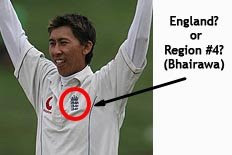 Wearing ECB gear is another matter. Why is the FA Cup so special? There are a few reason, but certainly, "A chance to play at Wembley" will be one of the most popular reasons given by players and fans alike. Playing at Wembley has a special charm. The venue is only used for a few select matches including England National Team games, the FA Cup Finals and the play-off championships of the lower leagues, so it is a great honor when one's team is involved in a match at the stadium. Nepal's Wembley - Dasharath Rangasala, lacks that charm. On the contrary, it's hard to find a Nepali footballer of any ability who has not played there. Just in the last few months everything from the Pepsi 7-A-Side to the B-Division to the qualifying rounds of the Coca-Cola School Tournament have been held there. As a result there isn't anything special about Rangasala these days: playing there is not special; watching a match there is not special. If anyone is curious as to why attendance at football matches is declining, that is one of the key reasons. There were no alternatives in the past, but now with the two ANFA technical centers in Sadobato and Chyasal, there really is no need to play minor matches at the national stadium anymore. Save Rangasala for the big occasions. When a player or fan goes to the stadium, it should be a highlight of their life. Cricket Association of Nepal (CAN) puts up a duck when it comes to the upcoming national Twenty20 tournament. No nicknames (See my article from a few days ago), no fanfare, no excitement - just same old, same old. The whole charm of Twenty20 cricket is that it's supposed to be fresh and entertaining and an alternative to traditional "boring" cricket. Below is the tournament schedule. Which region will you be rooting for? A better question would be which region is which?? ?